Editor’s note: Michael Shank is director of foreign policy at the Friends Committee on National Legislation. Emily Wirzba is program assistant for Sustainable Energy and the Environment at FCNL. The views expressed are their own. The agreement forged by Russia and the United States over the weekend on Syria’s chemical weapons is good news for diplomacy, and bodes well for any restart of the Geneva II peace process aimed at ending the country’s civil war. But the short-term focus on chemical weapons use risks undermining some much-needed long-term thinking on the issue. Of course, both sides in the Syrian conflict need to be held accountable for their alleged use of (or, in the case of some rebels, their alleged attempts to acquire) chemical weapons. But even after any stockpiles have been accounted for and dealt with, there will still be the outstanding question of how to resolve the ongoing civil war. And the Obama administration should belatedly be willing to address a surprising source of the current tensions – water shortages. Indeed, the sad fact is that the United States could have helped prevent tensions in Syria from escalating into civil breakdown if it had worked with the international community to tackle a growing problem with this most basic of resources. In the years leading up to Syria’s civil war, the country experienced a devastating drought, impacting over 1.3 million people, killing up to 85 percent of the country’s livestock in some regions, and forcing as many as 160 villages to abandon their homes due to crop failures. 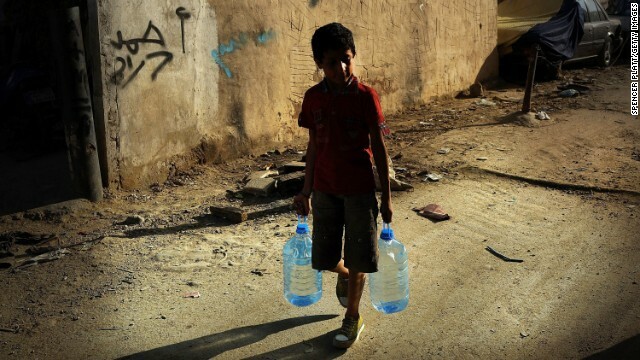 Back in 2009, as President Obama was taking office, there was talk of how Syria’s water scarcity problem could spark major social and economic instability. Indeed, the International Federation of Red Cross and Red Crescent Societies published an Operations Report on the Syrian drought, noting that some 800,000 people were severely vulnerable, and “over the past three years, their income has decreased by 90 percent and their assets and sources of livelihood have been severely compromised.” The National Oceanic and Atmospheric Administration for its part released a study in 2011 linking more frequent droughts in the Mediterranean and the Middle East to climate change, noting Syria was experiencing the worst drying in the region. Yet despite such alarm bells, the United States failed to move to mitigate the devastating impact the drought was having. A 2008 cable sent from Syria underscored the dire situation, with Syria’s agriculture minister stating publicly that the economic and social fallout from the drought was beyond the country’s capacity to cope with. In a direct appeal to the United States, the U.N. Food and Agriculture Organization representative in Damascus expressed his hope that “improving relations” between the United States and Syria might encourage the U.S. to become a donor to the 2009 drought appeal. As a result of lackluster U.S. leadership, the global response was weak: Donor countries coughed up $5 million, a mere quarter of the total that had been requested. How did Syria end up in this resource predicament? For decades, Israel has occupied one of Syria’s key water resources, the Golan Heights, where as much as one-third of Israel’s water supply comes from. It’s a resource that Syria has badly needed to tap. But the Syrian government’s mismanagement of water resources also contributed to the problem. A combination of growing water-intensive wheat and cotton, inefficient irrigation techniques like flooding, and leaky water distribution networks, have seen enormous quantities of water wasted. Syria also sold most of its wheat reserves when global prices were high, forcing the country to later import large amounts of wheat during the drought years. Desperate, farmers drilled illegal water wells, depleting an already-low water table and causing an increase in the salinity of the water. Indeed, within eight years, the number of wells drilled almost doubled to 213,000. As the New York Times notes, the Syria government eventually began “to acknowledge the scale of the problem and…developed a national drought plan,” while also attempting to obtain international funding for programs to address the widespread failure of crops. But lack of funding undermined these efforts. Sadly, Syria is not alone – Yemen is another country on the regional stability risk list as a result of its severe water shortages. And although sectarian tensions clearly play a significant role in the current regional unrest, it should also be clear that water shortages and their knock-on effects are in many cases the match that lights a firestorm of discontent and violence. If the United States wants to do something constructive to address potential flashpoints in the Middle East it would do well to address the root causes of tensions. And it will find ensuring that local populations have access to adequate resources far more effective – and less costly – than firing off more missiles. What a masterful red herring. Naturally Israel would seek to put stress on its enemies by depriving them of their traditional water source. But why hasn't this blog ever ever mentioned the agenda to take over all countries with independent central banks. That's the number one reason for this conflict, according to some prominent syrian commentators. Again someone says hey why couldn't America do this and it could have made things different. America if these people are unaware has just started to come out of the biggest depression in the last hundred years. Some of the richest countries in the world are right there in Syria's backyard, but it should left to the Americans, this gets old and should stop. If Syria didn't attack Israel without provocation in '67, Israel would have never occupied the Golan Hights in the first place. Granted, Al Assad was not in power back then, but I am sure Israel would have bent over backwards to help Syria as Jews are famous for being good samartians wherever humans are in need, but of course only if there were a realistic chance of lasting peace. Yet even in 2010, Syria was talking about bombing Israeli cities! So it is still Al Assad's fault to keep up hostilites towards Israel even in the face of a severe natural disaster. No wonder many impoverished – mostly Sunni – Syrians resent those who benefit from supporting the regime. In an affluent part of Damascus in August people were bathing in swimming pools and eating ice-cream, while others in the city continued with their daily lives, despite living in the shadow of fighting. Yes, water shortages contribute to conflict. But what contributes to water shortages? One huge factor is that there's a lot more people in the region using water. And the population is still booming. Remember those dire predictions of what happens if we don't limit our numbers? Well, it isn't a prediction anymore. It's here now. Syrians resent those who benefit from supporting the regime. In an affluent part of Damascus in August people were bathing in swimming pools and eating ice-cream, while others in the city continued with their daily lives, despite living in the shadow of fighting.